This Crowdestate review is 100% unbiased and based on my own experiences. Have you ever wondered about investing in real estate, but you do not have the huge starting capital? Or you do not want to mess with tenants? Then Crowdestate could be the platform for you. Everything you see on the Finance Freedom blog is presented with full disclosure and transparency. You can read about my successes and failures. Talking about money is still a taboo for too many people, let’s change that. I hope that you could benefit from my experience and improve your financial status as well. If you alreay have any experience, please share it with me and the readers and let’s educate each other. Now let’s move on to the Crowdestate review. The website launched in January 2014 and the first project was released in May 2014. In the time of writing, 26 372 investors have raised 54 647 960€ across 130 projects with an average return of 20,14%. If you are new to the crowdfunding concept, you can read more about it on this Wikipedia page. When did I start and how much did I invest? 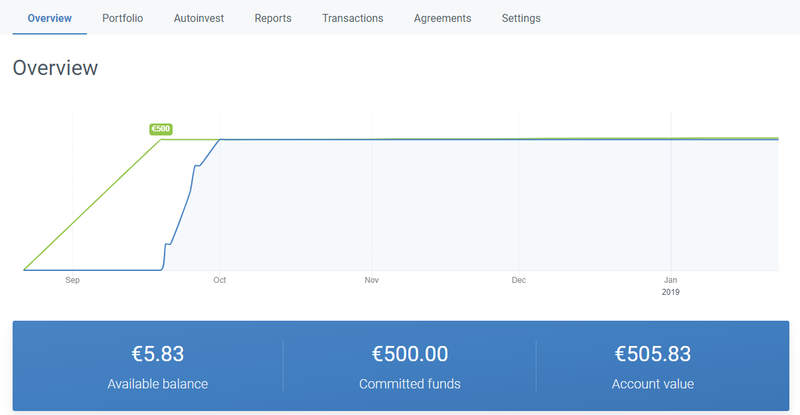 I started on Crowdestate on 19.09.2018 with a 500€ deposit, just to try it out. 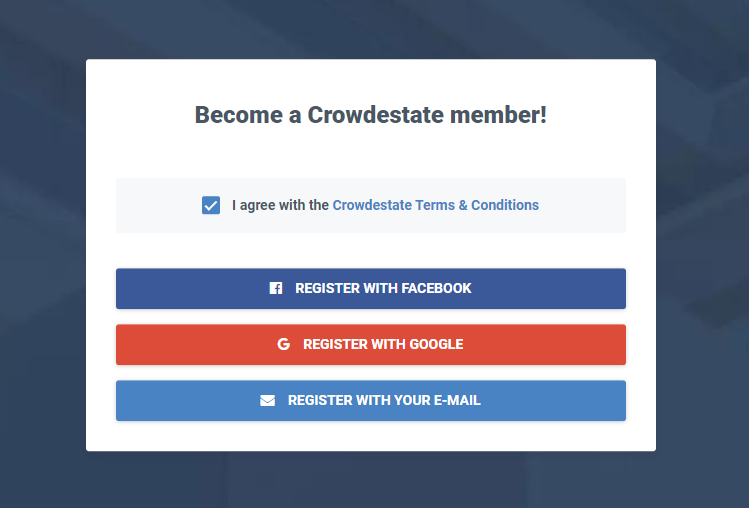 It’s very easy to sign up and invest with Crowdestate. If you have a Facebook or Google account you’re ready to start after a few clicks. Location shown with google maps. I really like the new graphs that were implemented in the last update. It’s easy to see how your portfolio evolves over time. Especially the “Expected next payments” is handy, to see when the next payments are planned. Whenever there’s an update to a project available, you can find the information in the “Recent news” section. I appreciate the updates where you can read if your investments are still on track. There’s also a nice graph showing expected next payments. This view comes with 3 different filtering options; 6 months, 1 year or all. Below you will find an overview of my active investments. They have an average expected return of 11,64%. You can also see the diversification level of your portfolio, divided into asset classes, investment types and ratings. 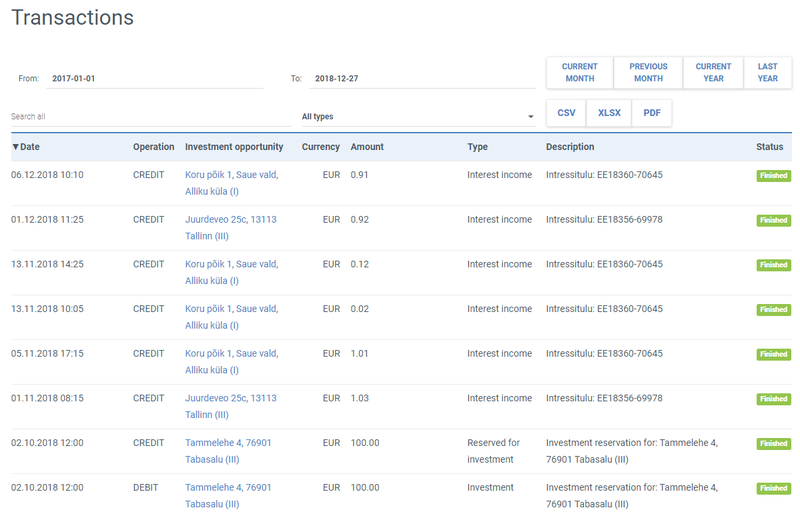 Plus when investments are finished you’ll be able to see how much you earned. A secondary market was recently added to the platform, which is great. Now you can exit your investments faster if you wish to do so. 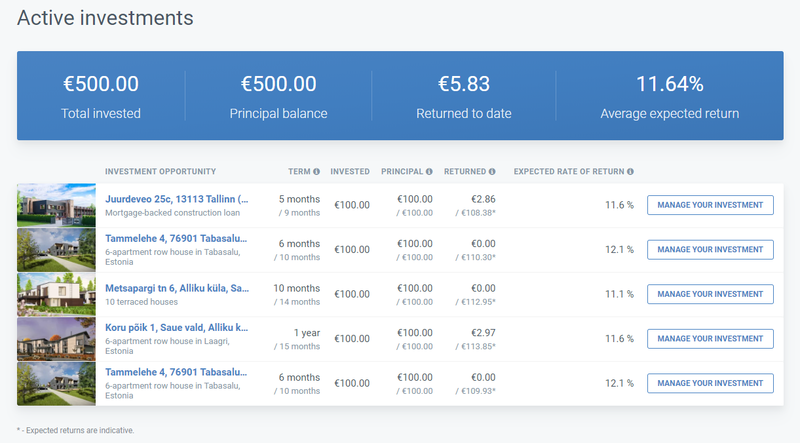 Under your portfolio page you can see “Active investments” and you can click “Manage your investment”. From this page you can choose your selling price and see your expected return as well as the buyers expected return. Personally, I don’t like the possibility to add mark-up’s to the investments. Like concert tickets, some people will buy more than they need, just to make a profit on the secondary market. 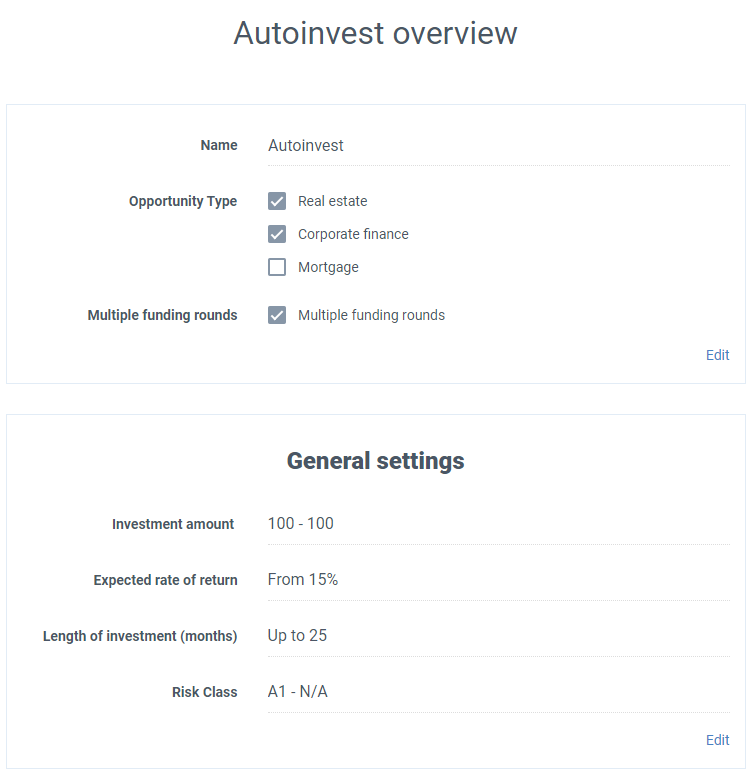 Like most platforms, Crowdestate have an “Auto-Invest” feature so you don’t have to select loans manually every time your account has cash available. 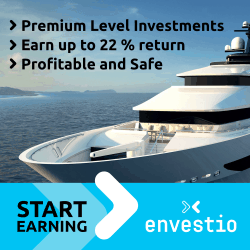 A recent update to the auto-invest tool ensures that everyone gets an equal share. 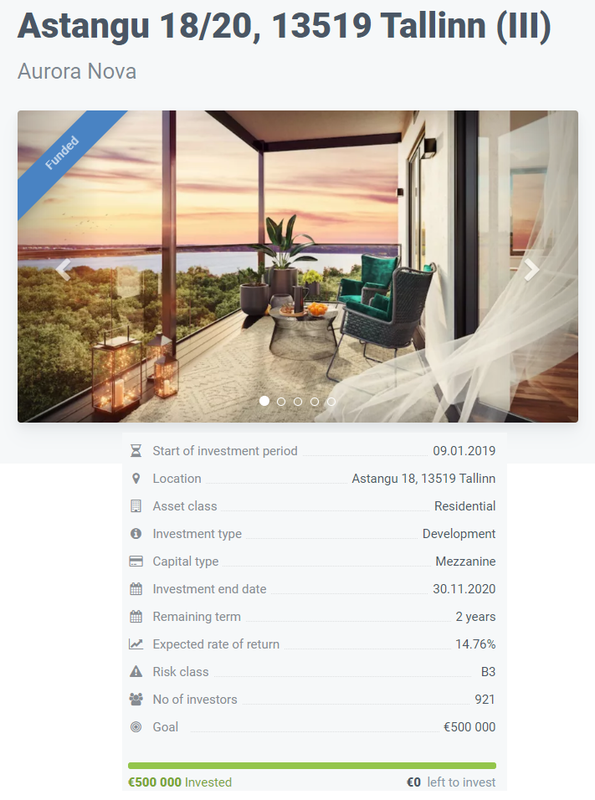 In the following example, I have chosen to invest in all projects with an expected rate of return from 15% per year, maximum 100€ and an investment horizon up to 25 month. If you have more specific investment criteria, you can set those under “show more settings”. You can create an interest statement by month, previous month, current year or last year. Additionally you can create a balance report. Unfortunately, the reports are in Estonian language only. It would be nice if reports matched your choice of website display language. This is where you can check all account activity. The transactions page provides a good overview of all monetary transactions. The list can be sorted in various ways. There’s even a free text search box which is handy if you want to search for a specific project. If you would like to have an offline copy, you can download the list as a CSV, XLSX or PDF document. There is no buyback guarantee on Crowdestate. However, they do have an excellent track record with zero defaults due to their rigorous due diligence process. Only about 5% of the best investment opportunities are opened for investing. 47 projects have been successfully exited. Note: past performance does not guarantee future results. If you’re looking for well established real estate investing platform with a long working history, Crowdestate would be an excellent choice. The platform is very easy to use and the support is great as well. Like previously mentioned, they have a 100% success rate after 4 years of operation and 20.14% average. Where else do you find a track history and high returns like that? That being said, interest rates have typically been in the range of 11-15% lately. It’s still pretty good, but I’d love to see more high yielding projects. With the stable investor growth they have experienced over the years, I wonder if those > 20% projects are a thing of the past. In the end, there’s only one way to see if you like it. Why don’t you try it for yourself? For those looking for other similar peer to peer platforms to invest, you may want to read some of my other reviews. 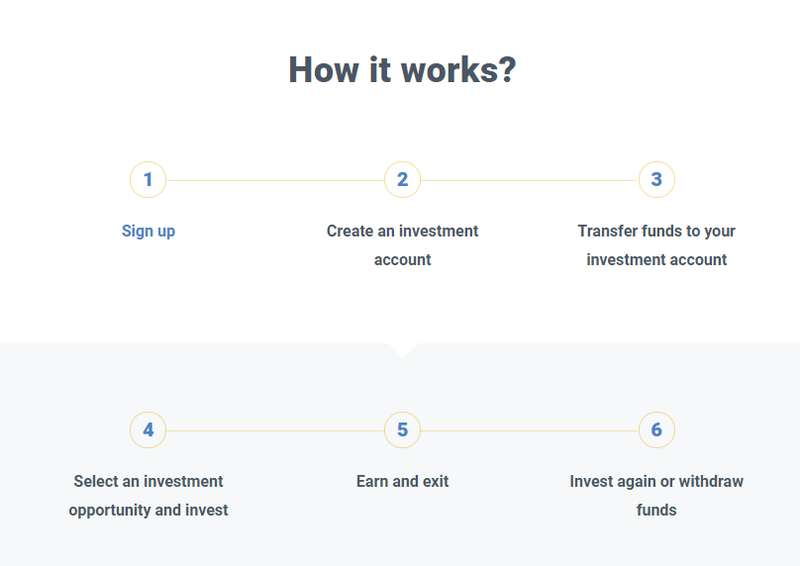 There are many peer to peer lending and investing platforms currently available, and you can diversify your interest income by using several of them simultaneously, just like I do. You can consider some other peer to peer companies. Just check my Mintos review, Estateguru review and Envestio review. Are you considering Crowdestate but still have unanswered questions? Go ahead and post your questions or concerns below! Or if you’re already a seasoned Crowdestate investor, what are your thoughts about the platform? Are you satisfied with the investing experience?